Marantz slashes prices of Pearl Lite hi-fi components, bundles AirPlay with NA7004 | What Hi-Fi? The SA-KI Pearl Lite SACD player drops to £750 from £1000, and the matching PM-KI Pearl Lite stereo amplifier is reduced from £900 to £750. 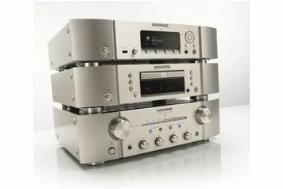 At the same time, the £700 Marantz NA7004 network audio player will include a free Apple AirPlay upgrade. This normally costs £39. Contact your Marantz dealer for further info.